IDC staff from the Sandton office took part in various activities for Mandela Day 2016 to make a difference where it counts most. Industrial Development Corporation (IDC) staff members were involved in various Nelson Mandela Day activities on Friday, 15 July. 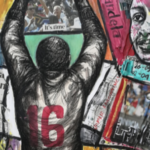 Nelson Mandela Day, which is celebrated on 18 July, encourages people the world over to take action and inspire change by giving 67 minutes of their time for worthy causes. For the IDC staff members based in Sandton, it was an opportunity to respond to the call by Nelson Mandela to “create a better world for all those who live in it”, and bring smiles to the faces of disadvantaged kids. In line with the IDC’s commitment to volunteerism, IDC staff participated in various activities in honour of the struggle icon. 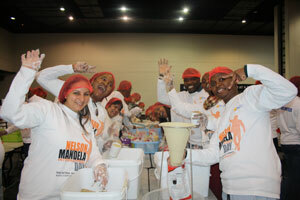 Some took time to visit crèches in neighbouring Alexandra, others joined in the Stop Hunger 10 Million Meals Challenge at the Sandton Convention Centre, while a third group took part in the Feeding in Action initiative at the IDC’s head office. 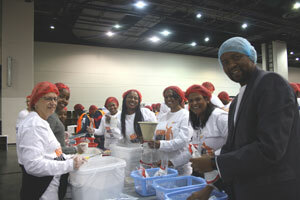 The Sandton Convention Centre hosted 200 IDC staff, among them IDC CEO Mvuleni Geoffrey Qhena, who volunteered in the Stop Hunger 10 Million Meals Challenge aimed at hunger eradication. The IDC staff were involved in packing highly nutritious meals comprised of rice, soya, dehydrated vegetable mix and a fortification pack of 23 essential minerals and vitamins specifically formulated to combat malnutrition. 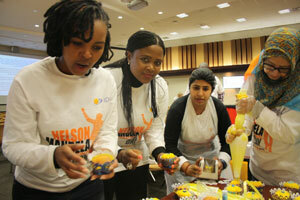 The event was a fun and engaging way for the IDC to be part of the drive to end child hunger. Speaking after the event, staff member Lizzy Poppy Khale said engaging in activities like the Meals Challenge made her very proud to be part of the IDC. “I chose this activity because it will be for the betterment of children,” Khale said. “I am saddened that even today children go to sleep hungry and in some cases it affects their schooling. 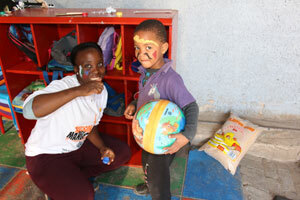 On the same day, around 50 IDC staff visited five crèches in one of South Africa’s oldest townships, Alexandra. They spent time with the little ones at the Sikelela Day Care, Mpumelelo Day Care, Unicorn Early Learning, Abazanyane EduCare and Ulwazi Learning Care centres. It was a day full of fun and activities as the IDC volunteers played games with children, helped serve meals and took part in face painting, while others washed the dishes and helped out with other chores. 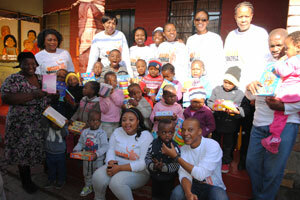 They also donated food parcels and educational toys to stimulate the young minds at all the centres. Thembelihle Nhlapo, one of the volunteers, said helping out at one of the day care centres gave her a chance to bring love and care to the young ones and helped her appreciate what she usually took for granted in life. Zandile Shoko, the owner of one of the day care centres, thanked the IDC for taking the time to visit them and for the contributions. Meanwhile, back at the IDC’s head office, 25 staff members participated in the Feeding in Action initiative, spending their 67 minutes packing over 500 goodie bags containing cupcakes, juices, oranges and snacks. This year’s Feeding in Action initiative benefited the children at the Bongani Community Development Centre (BCDC), a non-profit community organisation working with underprivileged children, youth and senior citizens in Glen Ridge, Johannesburg. The mission of the BCDC is to uplift the quality of life of South Africans from impoverished backgrounds, empowering them so that they can participate and contribute positively toward the building of a better society. Lebo Bodibe, an IDC Functional Champion in the Customer Relationship Management department, described the Feeding in Action event as a “very fulfilling and humbling experience because you know you are making a difference in someone’s life.”. Bongani Mthombeni, project manager at BCDC, expressed his gratitude to the IDC staff, saying they had made a difference in the lives of children who came from terrible circumstances. 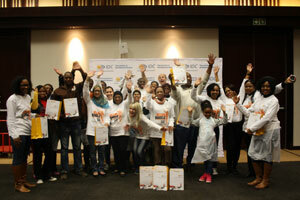 It was a special Mandela Day for more than 70 youths who attended the launch of the Career Link initiative by Unleashed Woman at the IDC’s offices on Monday, 18 July. Unleashed Woman is an initiative that aims to empower women to realise their full potential and make a tangible impact in bridging the unemployment gap among South Africa’s youth. The Career Link initiative, which aims to curb youth unemployment in South Africa, was formulated after Unleashed Woman partnered with two recruitment companies, primary partner We Find Talent and supporting partner Manpower South Africa. 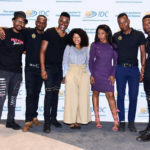 The IDC has since joined the partnership, along with Youthworks, a portal that provides young people with free online tools and info about career planning, and Edcon Group, the country’s largest non-food retailer. “Youth unemployment is one of the country’s major socio-economic challenges,” Lerato Thekiso from Unleashed Woman said at the launch. The young people in attendance at the Career Link launch went through a workshop, received practical training and guidance from experts, and were given a motivational talk. During a special segment of the launch dubbed the “Interview Closet”, the youths received formal clothing donated by the IDC’s staff and Edcon. Speaking at the end of the launch, Thekiso said: “What was most exciting for me was seeing so many youths that are hungry for knowledge so that they can take their lives to the next level. 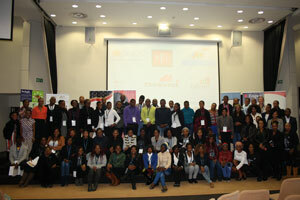 I think that the youths found the launch of Career Link very useful and exciting,” she added.